Over the weekend Infinite Warfare wrapped up month 1 of it’s 12 month long journey and all signs are pointing to early fatigue. I really don’t have a whole lot to say on the matter because I still have no interest in any part of this years release other than the numbers – and dam the numbers surely speak for themselves when it comes to comparisons. Infinite Warfare launched with the lowest peak players of any Call of Duty title – at least since Steam releases started (Modern Warfare 2) – and it set another record by being the first title to actually have its peak player count drop below the previous title (Black Ops 3) within that same launch month. At the time of this post the Infinite Warfare player counts have been below Black Ops 3 player counts daily since November 21st – just 18 days after launch. 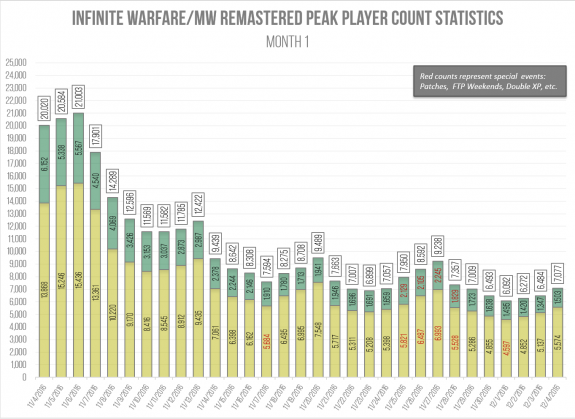 If you take Modern Warfare Remastered into account then both Infinite Warfare and Modern Warfare Remastered player counts are staying slightly above Black Ops 3 player counts but I would really only give that another week or two. Even though December 25th always seems to bring at least a handful of Christmas sales; I really wouldn’t expect too much change on the PC this year – but then again there really hasn’t been a big influx from Christmas sales on the PC since the Modern Warfare 3 or Black Ops days when a noticeable jump of thousands were seen post-Christmas. Too add salt to the wound; the missing players aren’t going back to Black Ops 3 – or really any other COD title. Black Ops 3 is practically down to just TDM games now (when I am on) unless there happens to be an objective based Contract for that day and without the mod tools being finalized and actual servers to run the custom content you can’t really expect it to draw people back to it. My biggest fear with the tools/servers for Black Ops 3 is that 1) it’s too late to have major effect now this late in the game and 2) that it will be the last straw. If something big doesn’t happen with them I don’t see tools ever happening again in COD based on the PC performance this year and what I expect to be the same next year with Sledgehammer’s title. There is no way resources will be budgeted for such a tiny group in the future. The only other notable thing to mention is Battlefield 1 and Titanfall 2 also just released recently around Infinite Warfare which adds another variable to the player base. Although I don’t see a lot of crossover to BF1 due to the differences with COD – it did have a strong launch and still continues to peak around 62,000 players. I did purchase Battlefield 1 but am still struggling to enjoy it to play repeatedly. Titanfall 2 although being praised as an excellent game is reported to have a rather weak launch (less than the first Titanfall) but last weekend I did take part in the Titanfall 2 free weekend and saw somewhere around 12,000 players on when I was playing. As far as I know there aren’t any complete stats readily available for Titanfall 2 so I can’t confirm what they are like now but much like the first Titanfall – the game just didn’t really appeal to me enough to invest in it. Honestly I enjoyed the Pilot combat but really don’t care for the Titans. When a Steam Free To Play Weekend happens for Infinite Warfare I may still check it out but really it’s doubtful. I think my interest in gaming is really at an all time low right now – even with all these hot AAA releases.